"Just get an electric guitar, and take some time, and learn how to play. 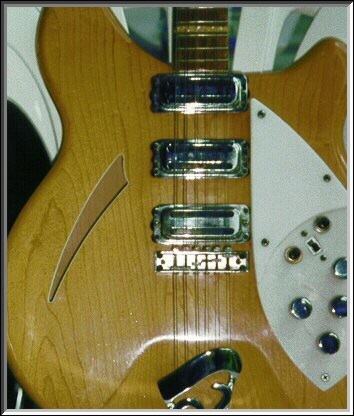 . ."
THE BYRDS • Rickenbacker Model 370/12Byrd, front and back. One would be hard-pressed to find an iconic electric guitar more strongly associated with a legendary artist or artistes for a longer period of time than the Rickenbacker 12-string is to renowned Hall of Fame guitarist Roger McGuinn and The Byrds. Indeed, through an ongoing association spanning nearly four decades, McGuinn and the Rickenbacker 12-string -- specifically, a Mapleglo Rickenbacker 370/12 -- have become inseparable and virtually synonymous in the lexicons of pop/rock music and its various forms and genres. 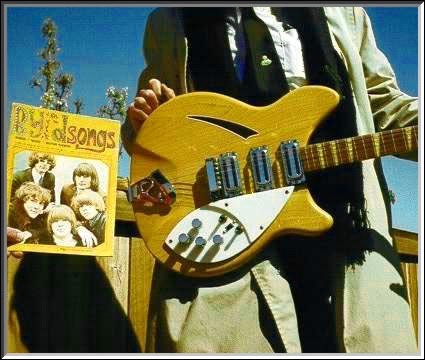 "The Byrds" and Tomcat with his Rickenbacker 370/12Byrd. Formerly McGuinn's main studio and stage guitar during the 1960s and 1970s, this is the second of only two 1960s Mapleglo Rickenbacker 12-strings used in The Byrds -- the one with the Vox Treble Booster -- and the only Rickenbacker 12-string McGuinn used in The Byrds while he was known both as Jim, then later Roger. Possessing more Byrds history than any other Rickenbacker, including the other three Byrds Rickenbacker 12-strings combined, this guitar recorded virtually the entire electric 12-string Byrds canon from Fifth Dimension on -- including both officially released live lp/cd versions of "Eight Miles High", as well as various movie soundtracks, etc. -- and was played through virtually every lineup of The Byrds while they were an ongoing band. Accompanying its long recording history, this guitar's illustrious stage history includes numerous television appearances in America and abroad, as well as countless live performances world-wide alongside scores of musical luminaries at such historic events as the legendary Monterey International Pop Festival, and on the hallowed stages of such venues as the Fillmores, Carnegie Hall, and the Royal Albert Hall where in 1968 it played to an audience which included such Byrds contemporaries as Jimi Hendrix, the Beatles and the Rolling Stones. Among many other such notable events was a benefit concert at the Los Angeles Sports Arena for the presidential bid of the late Senator Robert F. Kennedy only days before his tragic assassination. As one of the most rare and unique electric 12-string instruments to endure from the golden age of rock to the present, its musical contributions and distinct sounds remain some of the most recognized in rock history. 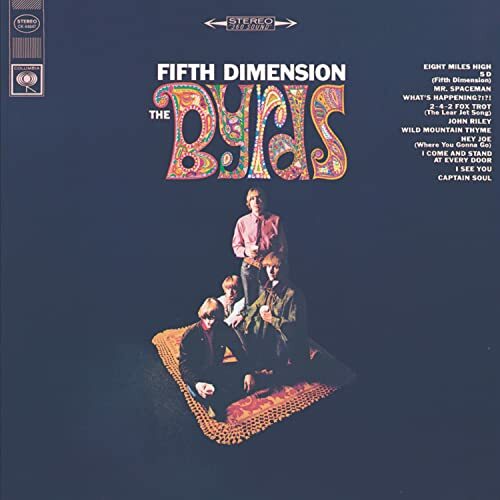 Well over three decades since it first began its tenure with The Byrds, it continues to have many of its previously unissued recordings released to this day, along with its already well-known classics. 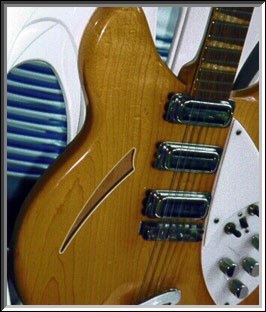 As the main guitar in a legendary band hailed by some as "America's first supergroup", and by the Beatles as "the American Beatles", it should come as no surprise then that the other Byrds Rickenbacker 12-strings which bookended its history have all been enshrined as museum pieces. The 1964 Rick is on display (Front | Back | Info | Display) at the Experience Music Project, and the two 1970 Ricks (the 1970 370/12 & the 1970 341/12SF) are the Rock & Roll Hall of Fame guitars. However, unlike its enshrined sibling Byrds Ricks, this one still sees limited action, and the timeless music of this fine fretted instrument's golden era is still being played on its hallowed strings to this day, along with other music befitting its unique heritage and electro-acoustic properties. While George Harrison brought attention to the Rickenbacker twelve string, James Roger McGuinn put it on the map. In my opinion, the Byrds' sound would have been impossible without the invention of the Rickenbacker twelve string electric guitar. In the days to follow A Hard Day's Night, the Byrds were nearly the only U.S. rock group Americans could be proud of. 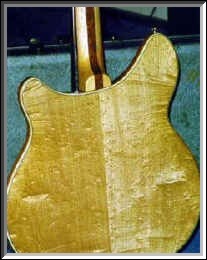 For more information about this guitar click here! Text and pictures courtesy of Tomcat.